Associated Press Notre Dame's Marina Mabrey, who scored 20 points Sunday, drives past Georgia Tech's Francesca Pan during the first half. SOUTH BEND – Muffet McGraw likes the way No. 5 Notre Dame distributes the ball. Lately, the coach has asked her team to get it more to sharp-shooting Marina Mabrey. 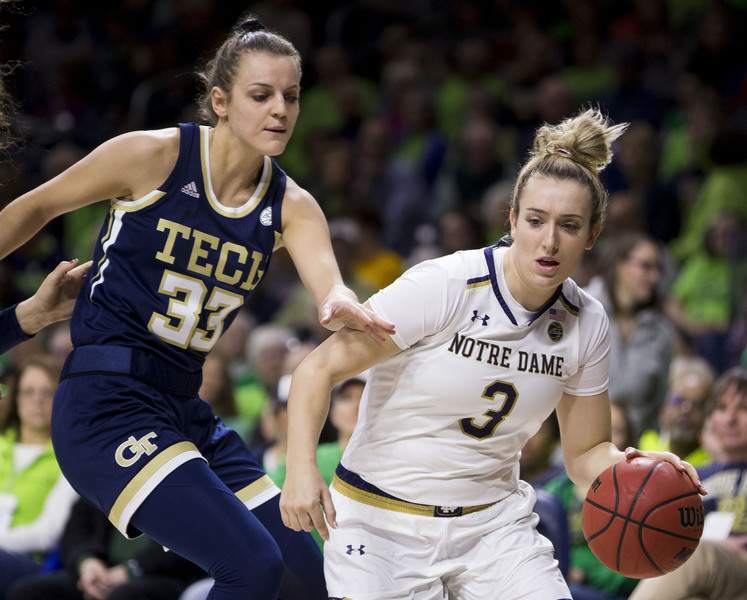 “We've been talking how we need to look for Marina more in transition and we've done a really good job of that,” McGraw said after her senior point guard scored 20 points Sunday in a 90-50 win over Georgia Tech. “Her spot is pretty much past half court,” McGraw joked after Mabrey hit 7 of 10 shots, including 6 of 7 on 3-pointers. Mabrey is 27 of 46 from long distance in her last seven games. Jackie Young scored 18 points on 8-of-11 shooting, and also had a team-best eight rebounds with four assists for the Irish (21-2, 8-1 Atlantic Coast Conference). Jessica Shepard scored 13 points with four steals and Arike Ogunbowale added 12 points and four assists. The Irish had runs of 8-0, 10-0 and 24-0 over two quarters to take a 54-13 halftime lead. They had a 9-0 burst on three of Mabrey's 3-pointers in a space of 1:11 of the third quarter to make it 74-30 heading into the fourth quarter. “I really think we showed our youth and inexperience,” said Georgia Tech coach MaChelle Joseph, whose 13-player roster includes 10 freshmen and sophomores.